On Wednesday, March 2, the Sociology Department, along with the College of Sciences and Career Services, hosted the third annual Sociology Career Day. The Key West Ballroom in the UCF Student Union was filled with the buzz of sociology students, eager to network with representatives from local and national organizations. Nearly 200 students and alumni visited this year’s career day. Students had the opportunity to mingle from 10 a.m. to 1 p.m., handing out resumes and receiving business cards in hopes of making a connection that would lead to a future internship or job opportunity. Recent sociology grad and current Disney employee Lisa Shick,’14, attended the event to network. “I hope to find an organization that will let me utilize my Sociology Degree more than I am now,” explained Shick. Approximately 40 representatives from 20 different organizations represented at the career day. Organizations such as City Year, Devereux, Feeding Children Everywhere and the Seminole County Sheriff’s Office are just a few that were represented. 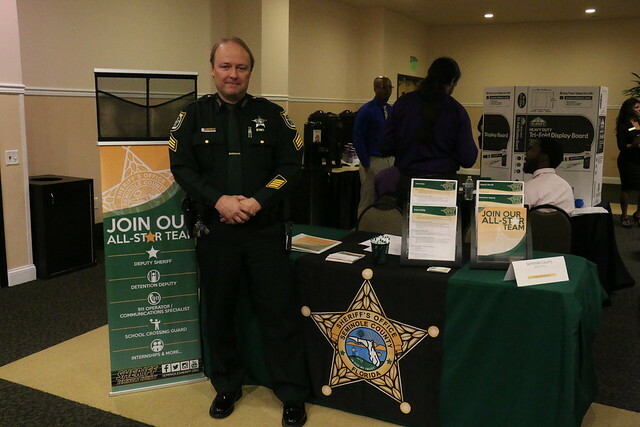 Sergeant Brad McDaniel from the Seminole County Sheriff’s Office raved about the success of their internship program thanks to the high quality interns he finds at UCF. “Our most phenomenal interns always come from UCF. The Sociology Department, by far, gives us the best quality of students,” Sergeant McDaniel shared. Members of the Sociology Career Day event team are excited about the growth of the event and look forward to future growth in the upcoming years. Below is a complete list of all organizations represented at the 2016 Sociology Career Day. ActivEngage, Altamonte springs police department, Aspire Health Partners Inc., City Year, Covenant House Florida, Department of Children and Families, Devereux, Federal Bureau of Investigation (FBI), Feeding Children Everywhere, Give Kids the World, Mental Health Association of Central Florida, Orange County Corrections, Orange Legal, Inc., Orlando Police Department, Seminole County Sheriff’s Office, UCF Police Department, UCF Victim Services, US Peace Corps, Volunteers for Community Impact, and Winter Garden Police Department.